“People who’ve inspired me have that same mix of integrity and passion… they want to make a difference,” Helen Gordon, Chief Executive of the Royal society of Medicine. 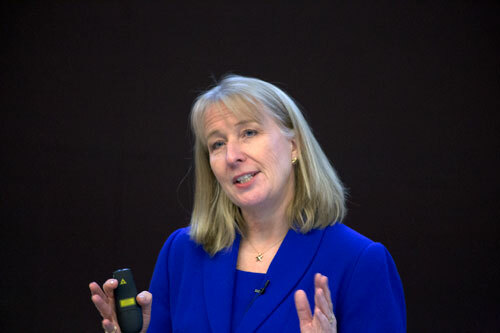 Helen Gordon, Chief Executive of the Royal Society of Medicine spoke at City, University of London about her career and life in the healthcare sector as part of the University’s Athena SWAN initiative. With a career spanning more than 34 years, Helen discussed her various roles and the challenges she has faced throughout her diverse and interesting professional life. Originally training as a nurse at St Bartholomew’s Hospital, London, Helen progressed through a number of clinical and managerial positions in hospitals in the National Health Service and in 2000 was appointed Chief Executive of Queen Mary’s Sidcup NHS Trust in South East London. In 2005, she moved from the NHS to national organisations, playing leading roles in the Royal College of Obstetricians and Gynaecologists and the Royal Pharmaceutical Society, Helen joined the Royal Society of Medicine on 1 March 2017 as Chief Executive. Speaking about how she got to where she currently is, Helen touched on her nursing background. Influenced by inspirational women at the hospital and on the ward, she then moved from clinical, to management and then CEO roles. Discussing how she was encouraged to apply for a one year CEO secondment at Hillingdon hospital in 1999, Helen spoke about how encouragement to look at her skills differently helped to give her the courage to apply. “Team approach is really important, and a focus on patients has always helped me through,” she added. In terms of things which helped her progress, Helen also highlighted her innate curiosity, offering to help outside of the job description, as well as developing people skills, confidence and resilience. Having moved from the NHS to the Royal College sector, she spoke about the importance of staying continually connected with the front line. Referencing her own development story, Helen spoke about how coaching and targeted development was very helpful, as well as her commitment to lifelong learning. This included achieving a Master’s Degree in Business Administration from Henley Business School which helped her prepare for more senior roles. Helen also noted that her biggest learning experience was working with patient groups and members of the public and she reflected on how “every experience is a learning opportunity”. In terms of motivations and challenges, she highlighted making a difference to patients, public and staff, as well as influencing the national health scene and global health issues. “We need to develop energy and resilience at work”, she said, as these strategies help when times get tough. Helen also shared anecdotes from her work life, and how she still encounters issues with paternalistic behaviour and ‘mansplaining’ but how these moments all provided learning points. “I’ve had an amazing and very lucky career journey,” she added. She also spoke about the importance of family and time for interests outside of work, and how we “all need flexibility over time to care for children and extended families”. “We do need to commit to helping each other,” she added, while saying how we all need to do more as we still live in a world of inequality. However, initiatives such as Athena SWAN are an important part of improving the situation.